Oysters, clams, mussels, lobsters, crabs, shrimp, cod, hake, RTE seafood meals, are all examples of products that are currently being processed with HPP. 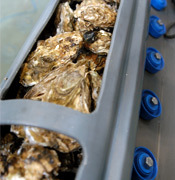 Processors can use HPP ranging from 200-350MPa to denaturize proteins from the adductor muscle of mollusks such as oysters and clams. Using HPP, the muscle, which is responsible for closing the shell, will not be able to contract and the oyster will open. This exposes the meat for easy extraction, resulting in a significant yield increase. 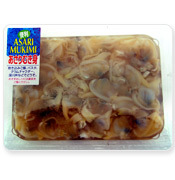 This application avoids: the handling of mollusks, which is a source of contamination, and a potentially dangerous knife manipulation while opening the shells. 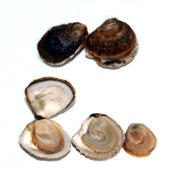 Mollusk shucking and higienization (Vibrio inhibition included) can be performed together to achieve quality seafood products such as safe, fresh tasting oysters with a longer shelf life. 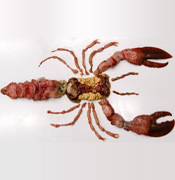 Using HPP, meat of crustaceans such as lobsters or king crabs will contract and detach from the shell, facilitating extraction with yields of almost 100%. The process also enables operators to work on smaller parts such as the legs or antennae of the crustacean where meat is most difficult to obtain. As there is no need for cooking, the process enables the meat to retain its natural flavors and provide customers with a fresh product for cooking prior to serving. Cold post-packaging pasteurization for shelf-life extension, keeping freshness, maintaining higher sensorial qualities, functional properties and improving food safety. Production costs are diminished as meat is easily extracted. Greater food safety and shelf life extension. No impact on sensorial and nutritional properties of the fresh product.